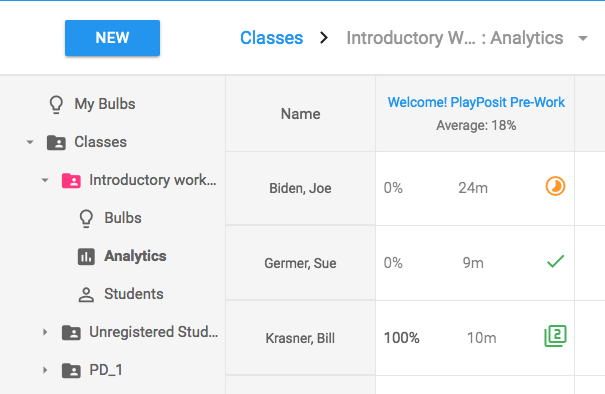 PlayPosit premium analytics provide instructors with data to do more! Views and responses metrics allow you to quantitatively gather learner engagement data when in My Bulbs or within Classes > Bulbs. 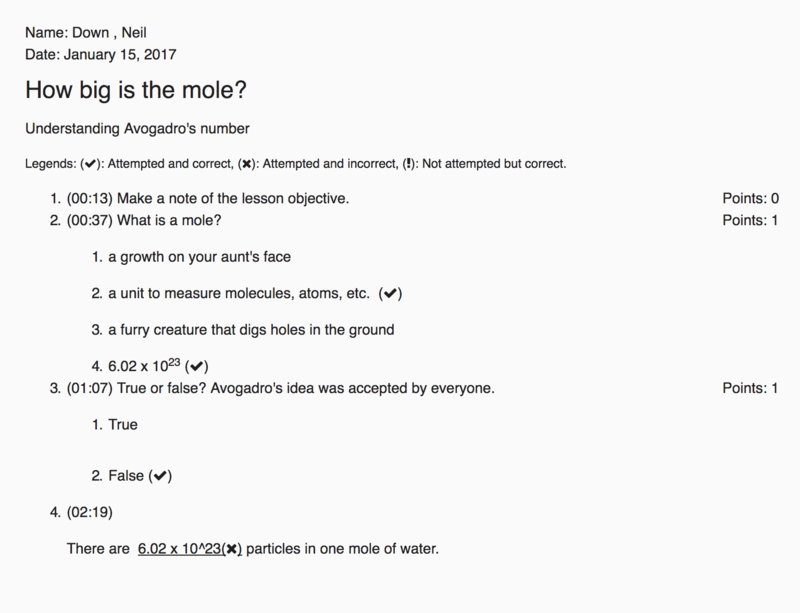 The response count is the number of learners who have attempted the lesson. This includes learners who have started, but not completed, the bulb. The view count is the number of times a bulb has been viewed. In the above image, the bulb highlighted in red has been assigned, but no learners have launched/started the bulb. Both Views and Responses are set to 0. If a learner retries a bulb once, the response count will remain the same, while the view count will increase by 1. In the first bulb listed above, one student has retried the bulb, and 4 others completed without re-attempts. In My Bulbs, the response count is the sum total of learners who have responded to that bulb across all classes. This excludes the number of times learners have retried bulbs. In Classes > Bulbs the response count is the total number of learners within that respective class who have responded to the bulb. This number excludes the number of times a learner has retried a bulb. In Classes > Analytics the number of learner entry rows for a bulb will equal the number of responses in Classes > Bulbs. In Bulb data export (csv) all learner responses are included. This includes all retry attempts, so learners may have more than one entry. What happens after I unlink a bulb? Great question. After you unlink a bulb, student data is archived, and inaccessible. The response count will be set to 0, and no data will be displayed on the Question-by-question monitor for that bulb. Before unlinking a bulb, to preserve data, we recommend running a Bulb data export. The analytics gradebook is available within My Classes in the left sidebar. Here you can view a gradebook. 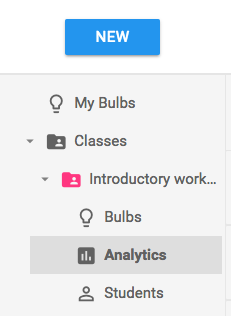 Bulbs serve as header columns and each row contains analytics per learner. The gradebook is used to see how learners perform across multiple bulbs and look at class performance from a higher level than the question-by-question breakdown for a single bulb. In this example, Joe Biden displays three values for the bulb Welcome! PlayPosit Pre-Work. The 0% is his score, the 24m is the amount of time in minutes Joe spent on the bulb. The orange progress circle lets us know the bulb is still in progress. Sue has scored a 0% as well, she spent 9 minutes, and has completed the bulb (green checkmark). Lastly, Bill scored 100% and he spent 10 minutes on this attempt of the bulb. The 2 stacked icon lets us know Bill has attempted this bulb twice. Since it's green, his more recent attempt is complete! If it was orange, it'd let us know Bill is still completing his second attempt. We've highlighted just a few users and when we include all the users in the gradebook, the average score for the bulb tallies to 18%. If you have many learners and/or many bulbs, there are Load More bars that will appear at the bottom (to load more learners) and/or right (to load more bulbs). 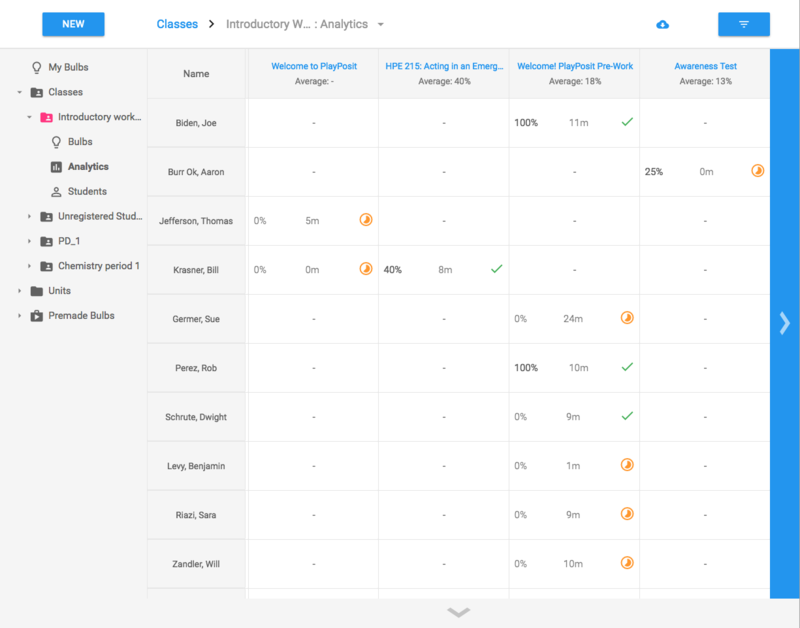 PlayPosit premium analytics include aggregate data on class performance, individual learner responses, average score, and time spend per question and video. In the Question-By-Question Breakdown, you will see both an overview of class performance and individual learner analytics. The colors indicate whether a response was correct, incorrect, or needs to be graded. Print a worksheet of learner responses by clicking on the triple dots next to any learner's name and Export. To learn how to export all of the data for a bulb, including all learner attempts, responses, and time spent per question click here.